With numerous NCAA, American, World, and Olympic records, Katie Ledecky is one of the most decorated female swimmers the world has ever seen. Although she won her first Olympic gold in London back in 2012 at the age of 15, Ledecky has a long and exciting swimming career ahead of her. Here are 11 interesting facts about Katie Ledecky. 1. How tall is Katie Ledecky? Katie Ledecky’s height is a whopping 6 ft 0 in (183 cm). That height makes her a full 8 inches taller than the average woman and puts her in the 99th height percentile for women. In her first ever Olympics as a young 15 year old, Katie won gold in the 800 meter freestyle. Since then, Katie has won numerous other medals at multiple national and international swimming competitions. Katie Ledecky walked away from the 2016 Rio de Janeiro Olympic games as the most decorated female athlete with four gold medals and one silver medal. Here is a table with Katie Ledecky’s Olympic medals from the 2016 Olympic games in Rio. Similar to many elite and Olympic swimmers, Katie Ledecky began swimming at the age of 6. Katie Ledecky was born in Washington, D.C. on March 17, 1997. Formerly know as the Curl Burke Swim Club, Katie swam for the Nation’s Capital Swim Club, a top swim club in the nation according to USA Swimming. Although she trained under coach Yuri Suguiyama leading up to the 2012 Olympics, Bruce Gemmell coached Ledecky through the 2016 Olympics before she went to college at Stanford. While her mother is of Irish descent, Ledecky’s parental grandfather immigrated from Czechoslovakia in 1947. Although her paternal grandmother is Jewish, Katie identifies as a Catholic. In addition to breaking the American and US Open record in the 500 yard freestyle multiple times, Ledecky graduated high school having broken every single Stone Ridge School swimming record except the 100 meter breaststroke. During her two year collegiate swimming career between 2016 and 2018, Ledecky helped Stanford win two NCAA Championships—the first in nearly a decade for Stanford women’s swimming. While Ledecky broke 12 NCAA records as a freshman at Stanford, she set another three the following year. Katie Ledecky signed with Dan Levy, a sports agent for Wasserman, one week after the 2018 NCAA swimming championships, making her ineligible to compete anymore in college swimming. 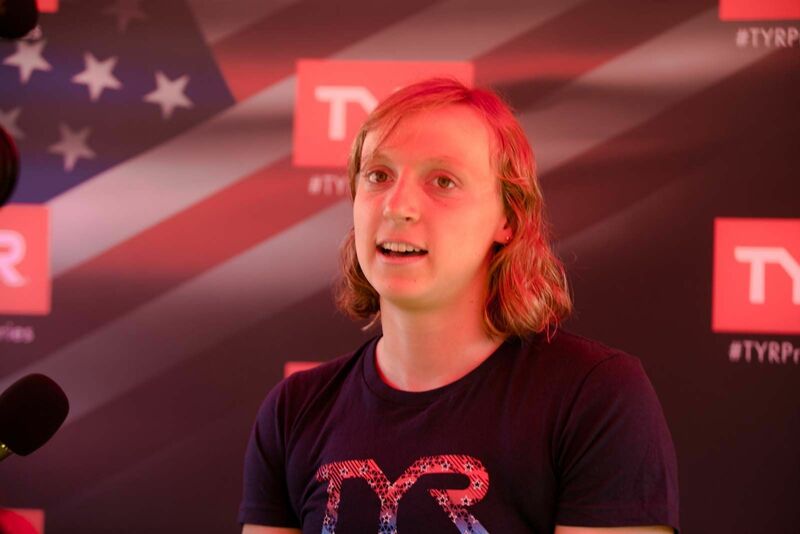 Going professional, however, allowed Ledecky to accept professional endorsement and sponsorship opportunities, her first of which was TYR, a major swimming brand. How much is Katie Ledecky worth? According to multiple sources, Katie Ledecky’s estimated net worth in 2019 is somewhere between $3 and $5 million thanks to multiple sponsorships and endorsements. Ever since her debut appearance at the 2012 Olympics, Katie Ledecky has been recognized and awarded honors by multiple international publications. For a complete list of Katie Ledecky awards and honors, check out her Wikipedia page. As a former Division I NCAA swimmer myself, I very much like blogging about swimming. Check out some of my other swimming blog posts here, and let me know how fast you think Ledecky will swim in the 2020 Olympics in Tokyo.